Weapons need to be collected and activated with a telegun-on tile. You can then teleport with pistol and grenade by hitting hook/unhook (collision) tiles with a telegun-activator tile on top. Laser teleports you if the last tile it bounced off was a telegun-activated tile or if it didn't hit a collision tile at all. These tiles activate/deactivate a weapon as a telegun-weapon (pistol, grenade, laser). They behave like solo-on/-off, superjump-on/-off, etc. Placed on top of a collision tile, these activate a tile as a spot to teleport to. 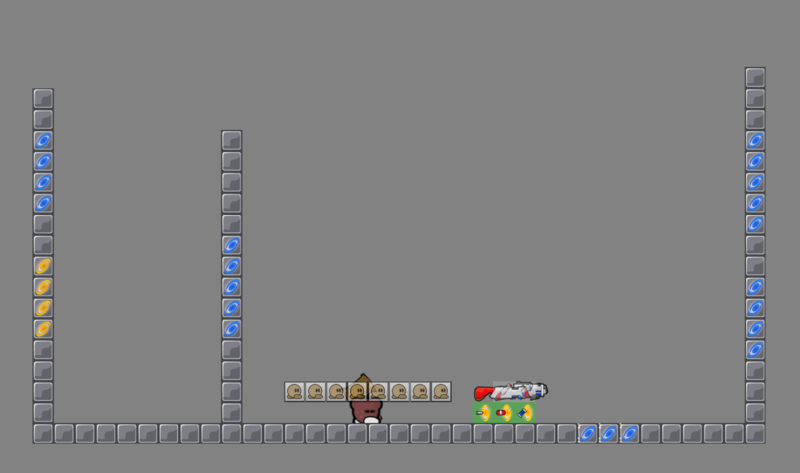 The orange one cancels movement after teleporting while the blue one preserves movement. Note, that unlike normal teleporters, hook is always preserved by teleporting with telegun. You can use the switch layer to allow only specific weapons to teleport onto a tile.